Paris / worldwide. One exciting piece of news this week is the publication of a new installment of a diminutive Gaulish adventurer’s globe-trotting escapades. Published last Thursday in France, Astérix chez les Pictes also appeared on the very same day in twenty-five languages, which in itself is cause for celebration. Along with the usual suspects (English, Spanish, German, Italian, Dutch) it’s good to see a fair slew of minority languages too. Readers on the Iberian peninsula have been particularly lucky, with no fewer than six editions catering to the various language communities there—Portuguese and Castilian, of course, but also Asturian, Basque, Catalan, and Galician. His feelings on nationalist movements aside, the Asterix of Astérix chez les Pictes may look familiar; in fact, the writer-illustrator team is brand-new. In the Vanguardia, illustrator Didier Conrad describes learning to draw in the style of Albert Uderzo being like “learning Spanish if you speak Italian.” Astérix chez les Pictes is a first outing for Jean-Yves Ferri as writer too. 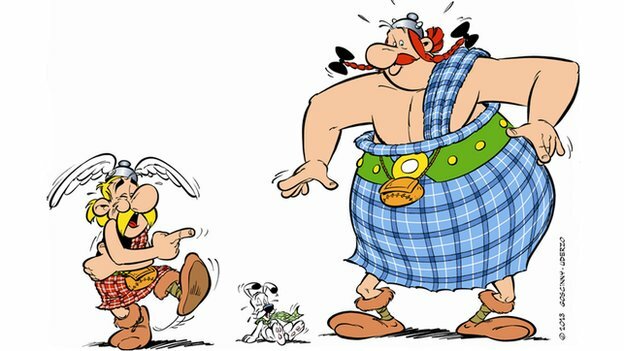 English readers may find the voices of Asterix and friends more familiar, though: the wonderful Anthea Bell returns as his English translator. The Guardian ran a preview of her work on the new album—disappointingly free of her usual punning pyrotechnics—and you can read an old but worth-revisiting interview with Bell here. Naples. It’s somehow heart-warming to think that people still care enough about the printed word to risk very long prison sentences to get their paws on that must-have 1609 first edition of Kepler’s Astronomia Nova. But it’s probably not a good thing that 1,300 of the 4,000 rare books and manuscripts stolen from the Girolamini Library are still missing, as Claudio Pappaianni e Luca Piana report in L’Espresso. So if you see a 1518 edition of Thomas More’s Utopia lying around anywhere, do give them a call. Paris. The first big French literary prize of the year goes to Christophe Ono-dit-Biot’s Plonger. Earlier this week L’Express ran an interesting round-up of the favourites for the various (and almost countless) French prizes. Pierre Lemaitre looks likely to be the biggest winner this year, with an incredible four shortlist appearances (for the Goncourt, Renaudot, Femina, and Interallié prizes) for his novel Au revoir là-haut. Berlin. It seems that Suhrkamp, one of the grand old European publishers, will live to fight another day, as reported in Die Zeit. No one comes out of this very well, but it could have been worse. London. A week ago, Asymptote Editor-at-Large Nashwa Gowanlock wrote about the wonders of International Translation Day. For another perspective, check out (British Centre For Literary Translation head honcho) Daniel Hahn’s take on events here. New York. Three Percent reports on literary translator Jonathan Wright’s less-than-positive experience of working with Knopf. “Holy shitsacks” indeed. Keep an eye out here for Asymptote’s thoughts on the situation, which will be online in the next day or two. Watch next week as the Neustadt Festival ramps up, this year with a special focus on the Middle East. The keynote author is Naomi Shihab Nye (Palestine), who will receive the 2013 NSK Neustadt Prize for Children’s Literature. Candidates for the 2014 Neustadt Prize (also known as the “American Nobel”) include César Aira, Duong Thu Huong, Haruki Murakami, Ghassan Zaqtan, and Edward P. Jones (the first ever African-American candidate!). The winner will be announced on Nov. 1st. The Hong Kong Literature Fest starting next week (Nov 1-10) has a great-looking lineup! Highlights include: Korean writer and Man Asian Literary Prize winner Kyung-sook Shin, who will talk about her book Please Look After Mom, the first Korean novel to appear on the New York Times Bestseller list; Guo Xiaolu, whose novel I Am China was excerpted in Granta’s Best of Young British Novelists; Sjón, the Icelandic musician/writer on muses and his collaborations with Björk; and Ma Jian, who will talk about his latest novel, The Dark Road, which takes on the destructive effects of China’s One Child policy.